The open-ended question of “What do you want to work on today” is often met with incredulity by some instructors along the lines that the learner will always answer along the lines of the headline for this post. And they are most likely correct. Their learners probably will give that answer. That’s because just as deficiencies in instruction can lead to learners displaying certain types of fault, being instructor-led from the very beginning will lead to reliance on the instructor for the topic. Think back to when you first trained to become an ADI. I’ve no doubt there were times you were aware of something you wanted to work on but your trainer was more led by the syllabus they wanted to deliver rather than what you thought you needed to work on. The next point, of course, is how does the trainee know what they need to work on? People are invariably sensible, on the first lesson some people want to stop and go, some want to turn into junctions and some want to change gear. No-one to me at least has ever suggested they want to go 70mph down the motorway in the first 30 minutes. You can then build on that first lesson to each subsequent lesson. The natural progression from moving off and stopping will be into slow speed clutch control and 2nd gear, maybe third depending on the pupils’ ability, then left and right turns. In these early stages, a suggestion to help the pupil who wants to improve steering and/or clutch control would be the turn in the road which practices these skills, all of which are transferrable to all of the other manoeuvres later in the training. I use the DVSA learner record, merely because it’s there and I’m lazy, but you can use whatever progress sheet you need as long as it lists the overall requirements. In this way, the learner knows what they need to achieve and knows what level they need to reach to be independent in each area. If you talk the pupil though what they need to acomplish, and identify the faults, then when you let them have a go independently they will almost always tell you what the faults are themselves. So let me slay this beast once and for all if you explain to the learner the standard they need to reach overall, and allow them the freedom to assess themselves where they are against that standard, then they will guide you in their learning process. How to set up routes (My Tracks) on TomTom from the comfort of your own home. One of the reasons the DVSA picked the TomTom was its ability to record and playback routes, so they can keep them standard for the test. The syncing features of MyDrive are currently compatible with GO and START 4x, 5x, 6x series / GO 400, 5×0, 6×0 / 5×00, 6×00 / Trucker 5000, 6000 as well as Rider 40/4×0 devices and the Android and IOS Apps so you don’t need a Start 52 to make use of them. The New Vehicle Safety Questions (Show me tell me) can be seen here. On marking the new SMTM questions a DF for an incorrect “tell me” will be “held” until the “show me” has been completed. If the Show Me results in a serious then only that will be marked, otherwise only a single DF will be recorded. “Earlier in October we updated you on the delay to the changes to the ADI part 3 test. We wanted to let you know that we still do not have parliamentary approval to make them and that we’ve written to candidates with tests booked until 1 December to explain their options. It is important to note that this delay does not affect the changes to the driving test that are being introduced on 4 December. We’ll keep you informed of further developments and let you know when the changes will be implemented. The follow up to ORDIT trainers says there are two options if you have a test booked between 13th of Nov and 1st of December you can either take the existing Part 3 or move the date out for the new one. In a few weeks the ‘new’ driving test will be in operation, there has been as you would expect more than a degree of comment from driving instructors and pupils who are, as it were instructing and learning under the ‘old’ test but in some cases take their test under the ‘new’, for instance, someone who takes a test now, fails and can only take a re-test after the 4th of December. Most instructors will have of course discussed this with pupils and will have covered the changes along with the new requirements as a matter of course and whatever the ‘rights or wrongs’ of the new system it’s unlikely that pupils will have any problems completing the new. This is not, of course, the first time the ‘test’ has changed since it became mandatory to take and pass on April 1st, 1934. It was not met with universal acclaim or acceptance, and comments in the motoring press are quite illuminating. Anyone could be a driving instructor no qualifications or experience required then, but the ‘uniform’ of instructors working for large organisations appeared to be a suit complete with bowler hat! The test itself would be recognisable by today’s pupils, the question of whether it was easier or harder to pass in those far off days is questionable, but I would say that the modern pupil and for that matter structure would most certainly get quite a culture shock if asked to drive to test standard a 1930’s car. No synchromesh gearbox and cable or rod operated brakes, anyone? The 1940’s and again in the mid-1950’s saw the test suspended, and thousands of mostly men were ‘tested’ during their military service. The ‘test’ then seemed to be a case of if you could start and stop and drive around a parade ground without hitting anything or anyone you passed, needs must I suppose. Pupils and motoring journalists have always had a lot to say, and I found a couple of real gems in a 1950’s article and letters pages of ‘Practical Motorist and Motorcyclist. The editor F.J Camm was of a similar opinion, not enough examiners and certainly hard to find the examiners of the right experience and calibre, it, therefore, should be abolished, as like many other experiments which have been introduced in the name of road safety it has failed and an examination of the accident statistics has shown it has made no impact on the problem. Perhaps, we do after all live in more enlightened times. “Further to my email of 1 September 2017, I wanted to let you know that we have yet to gain Parliamentary approval to introduce the change, but are still hopeful that we will be able to do so by late October. Having written to all PDIs with a test booked up to 13 October, we will now been contacting all those with a test booked up to 27 October. We’ll be able to give them more options on what they can do, such as postponing their test to a later date or keeping their test date and taking the test in the current format. They’ll be advised to speak to their instructor trainer to discuss the best option for them. We will also be contacting all those on the Official Register of Instructor Trainers. 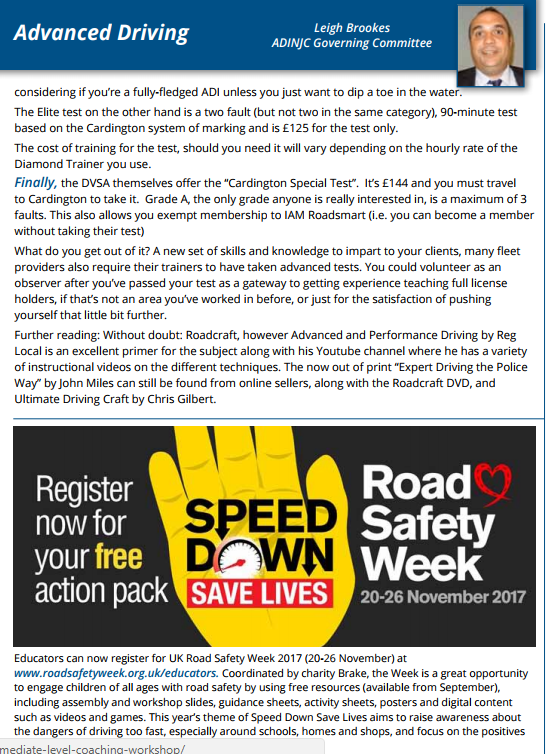 As I said before – I’m still hopeful I’ll win the lottery as well…..
My latest column in the NJC newsletter covers the different types of Advanced Driving test available. Regular readers on this site might notice it’s similar to another post from earlier in the year, but if you can’t plagiarise yourself, who you can you plagiarise? How much will your car cost over its lifetime? 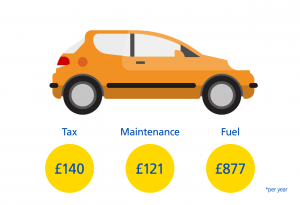 Some interesting research on running costs of different types of car from Aviva. Is FOMO influencing dangerous driving? What is FOMO I hear you ask? Yes its another study on Driver Distraction, this latest blog post comes courtesy of Aviva Insurance who brought the research to my attention. After the introduction of stiffer penalties in March, police (UK wide) have caught nearly 6,000 drivers using their devices behind the wheel. As predicted in an earlier post, I didn’t envisage the penalty increase making much of a difference. 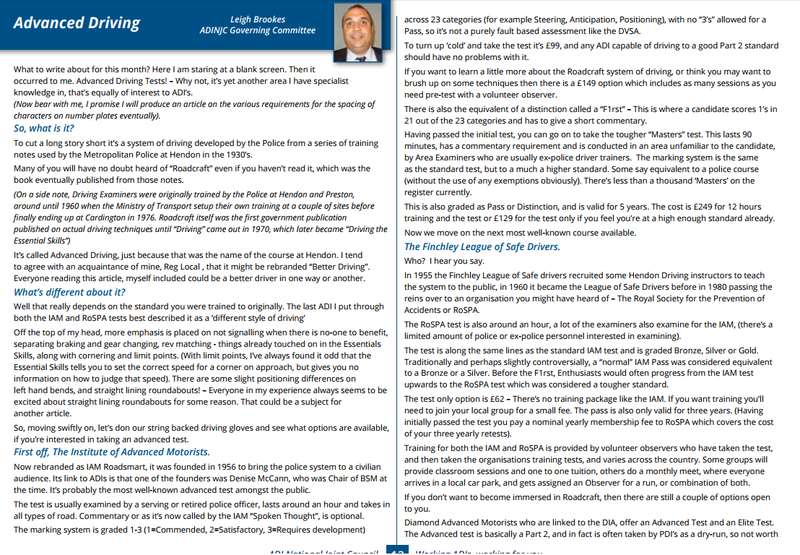 Featured in Industry Magazine “Driving” as DIA Instructor of the Month.